In a recent interview with the Department of Information, the Agriculture official said his team was eagerly anticipating the two-day event which is scheduled for March 24th and 25th at the Villa Grounds in Charlestown. 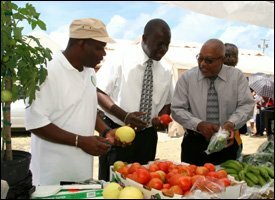 With emphasis on variety, the event will be held under the theme â€œdiversify to satisfyâ€ and is expected to showcase varying aspects of Agriculture on Nevis from fruits and vegetables to plants and animals. Following the DOAâ€™s trend of alternating patrons from the three departments within the Ministry of Agriculture, Mrs. Althea â€œSallyâ€ Parris was selected to be in the spotlight this year. â€œShe is one who has been very consistent and sheâ€™s at the Open Day every year since we wouldâ€™ve started and so we are happy to honour her this year as our patron,â€ he said. Taking example from the Nevis Island Administrationâ€™s Ministry of Agriculture, the DOA has, over the years, â€œencompassed all three departmentsâ€ [fisheries, cooperatives and agriculture] for its annual Open Day activity. â€œWe are encouraging participants to get ready and mark the dates. The Department of Agriculture will be putting on the usual exciting and educational activity. We are encouraging the support of all of you here on the island of Nevis,â€ Mr. Evelyn said.